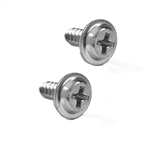 Door bullet mirror mounting screw. This screw mounts the mirror to the bracket. Correct reproduction replacement gasket used to install 1970-81 bullet mirrors on all Camaro and Firebird models. For use with manual RH mirror or LH remote mirror.